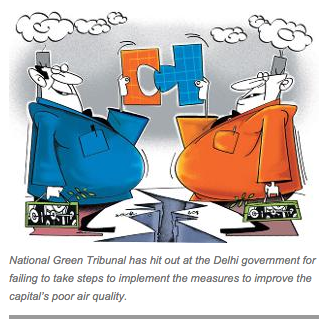 “The National Green Tribunal has hit out at the Delhi government for failing to take steps to implement the measures the tribunal had set out to improve the capital’s poor air quality. The tribunal also directed the Arvind Kejriwal government to submit a report on the proposal to ban diesel vehicles, which are more than 10 years old, and the exact number of diesel vehicles plying in the capital and their impact on air quality by April 7. “The scientific data indicates the problem is severe and its result can be drastic if permitted to persist,” NGT chairperson Swatanter Kumar said.” The Economic Times. Read it on delhiair.org.